Other than his christening in 1564, there is no recorded information about Shakespeare until his marriage. He married a 26-year-old woman named Anne Hathaway when he was 18, in 1562. They had a daughter, Susanna, and twins, Judith and Hamnet. Shakespeare left Stratford-upon-Avon, where he was born and married and presumably educated, around 1590, when he first turned up in London. No one really knows which of his plays he wrote first, although most scholars believe early plays were The Comedy of Errors, The Taming of the Shrew, Richard III, Two Gentlemen of Verona, and Love’s Labour’s Lost. Shakespeare was a player (actor) as well as a writer. He kept up a furious pace, writing new works for his company, The Chamberlain’s Men, and performing too. He made hardly any money from his plays; they were owned by the acting companies. He was a shareholder in his company. It is assumed that he visited his family in Stratford, but nobody knows how often. Later in life he bought a large home there known as New Place. Shakespeare’s son Hamnet died at age 11, cause unknown. Shakespeare moved back to Stratford when he retired from playwriting and acting, sometime between 1612-1616. Shakespeare died in 1616 and is buried at Holy Trinity Church in Stratford. 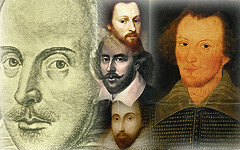 There are thousands of books and articles written about Shakespeare and his plays and poems. It must be frustrating for Shakespeare scholars that so little is known for certain about his life. What was the connection between the man William Shakespeare and his enduring works? A question for the ages! What facts about Shakespeare fascinate you?